Recently I had a chance to try some innovative new lens technology. 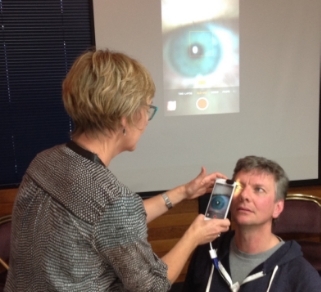 Using a simple device I was able to convert an IPhone into a specialized tool to examine eyes. With a small group of optometrists I met Hanna Eastvold-Edwins from ODocs Eye Care. ODocs was started by Dr Hong Sheng Chiong. Hong is an ophthalmologist with a passion for technology and gadgets. Several clinical attachments in third world countries (Kenya, Nepal and Malaysia) were key for Hong. These experiences have given him the insight to the burden of preventable blindness. He believes the problem lies in the access to quality eye care and he is part of the solution, designing his own equipment. His company, ODocs, develops ultra mobile and economical eye tests and diagnostic devices. He has invented several eye imaging adapters for a mobile phone to diagnose and track eye diseases. He shared his inspiring story at TEDx Auckland. Watch him tell his story here. The accolades for Hong continue. He was recently Highly Commended at the NZ Innovators 2016 awards in February. What did I think? The results are impressive. Compared with the optics of our microscopes and specialized lenses? The views using a phone with the attachments were good. I expect these devices will find their way into optometrists rooms as well as out 'in the field' they are designed for.